Dark Sky Choir announced today they have recruited guitarist Ira Black (I Am Morbid, Lizzy Borden, Vicious Rumors, Metal Church) and announced their US tour with Bobaflex to begin mid-April. Dark Sky Choir features vocalist Brian Allen (Vicious Rumors), bassist Percy Trayanov (Madame Mayhem), drummer Mike James Sakowski (Exxplorer) and has featured such names as John Moyer from Disturbed. Their new album, End Of Days, was written and produced by John Moyer, Rick Santaniello, Fred Gorhau and will feature Ira Black. Dark Sky Choir will begin their spring tour on April 17th with Bobaflex, with a special debut performance with Ira Black in Los Angeles at Ultimate Jam Night on April 9th. DARK SKY CHOIR has announced the addion of guitarist Ira Black (I AM MORBID, LIZZY BORDEN, VICIOUS RUMORS, METAL CHURCH) to the group's ranks. 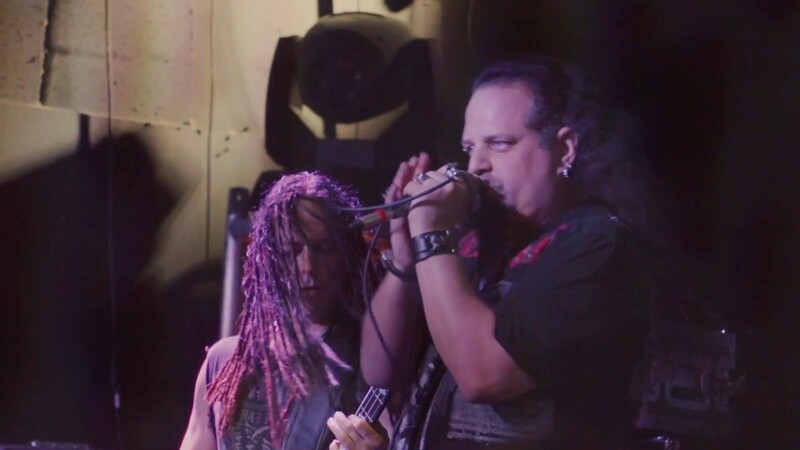 DARK SKY CHOIR features vocalist Brian Allen (VICIOUS RUMORS), bassist Percy Trayanov (MADAME MAYHEM) and drummer Mike James Sakowski (EXXPLORER). The group's new album, "End Of Days", was written and produced by DISTURBED bassist John Moyer, Rick Santaniello, Fred Gorhau and will feature Black. DARK SKY CHOIR's spring tour with with BOBAFLEX will kick off on April 17. A special debut performance with Black will take place on April 9 at the "Ultimate Jam Night" in Los Angeles. My favorite of the evening was Dark Sky Choir. I swear there must be something in the water in New Jersey with all the killer hard rock and metal bands this area churns out. Influenced by classic metal music, Dark Sky reminds me of early Black Sabbath. Starting out as a tribute band, these four talented musicians soon realized it was inevitable that they did their own thing. I loved these guys! For those who say there isn’t any good recent metal, well here it is! The lead singer, Brian Allen, sounds like a young Dio, having a vocal range that gives us those long, drawn out notes that keep up with the retro metal guitar riffs. And they are nice guys, truly passionate about the music. Metal heads, there is hope! Dark Sky Choir opened the concert. The members wedged themselves onto the crowded stage and proceeded to pummel the crowd with brutal power chords and lead guitarist Fred Gorhau’s six-string pyrotechnics. The New Jersey rockers had plenty of hair for head banging, except drummer Mike Sakowski, whose bald pate served as follicular counterpoint. Frontman Brian Allen stared the crowd down between blood-curdling screams and the quartet looked downright mean. Bassist John Moyer, who used to play with seminal heavy metal act Disturbed, controlled the low end as the band played songs from its 2016 debut and 2018 self-titled EP. March 8th was not an ordinary Thursday night. It was a bit of an extra special night because the “Judas Rising Tour” hit Tempe Arizona at the Marquee Theater. As the night grew dark and the venue began to fill so did the excitement as the fans. Dark Sky Choir’s high pitched vocals and classic heavy metal rifts made for an awesome time. With Brian Allen belting out those high notes accompanied by the rest of the guys shredding their rifts. They got the crowd head banging. Their set was short but sweet. Brian Allen, one of our local Portland rock stars, is also the singer for the East Coast band, Dark Sky Choir. He is an amazing front man; one who fronts many bands. Dark Sky Choir was energetic, technically great, and the buzz around the venue was that the bassist was the bassist for Disturbed, which took fan’s respect level and interest up 10 notches it appeared. The opening acts are sublime. New Jersey four-piece Dark Sky Choir kicked things off with a half hour of high-decibel hijinks from their self-titled debut and recent Reboot EP. Comprised of Brian Allen (vocals), Fred Gorhau (guitar), Mike Sakowski (drums), and former Disturbed / Adrenaline Mob man John Moyer (bass), the Choir crushed on “Death of a Nation,” “Like It Or Not,” and “Die Young.” Allen—whose high notes were not unlike Judas Priest singer Rob Halford’s banshee wails—sported black pants and vest with patches that showcased his love for horror fiction and film (Frankenstein, Mummy, Edgar Allen Poe). DARK SKY CHOIR started out the evening right. Their set was comprised of classic heavy metal riffs and the astounding high pitched vocals of Brian Allen. Only a stupid idiot (yep, another Y2Jism) wouldn’t notice that their sound is reminiscent of the legendary Judas Priest, so I was not surprised to learn that Allen was once part of a Judas Priest tribute band. Adding to the depth of their music was veteran bassist John Moyer, also of Disturbed. It is generally a tough gig being the first band up, but Allen’s vocal range combined with the rest of the bands shredding riffs made the crowd take notice and the head banging began. Taking along a list of talented supporting acts, first up on the bill was New Jersey’s Dark Sky Choir. After releasing their eponymous debut album in 2017, Dark Sky Choir endured a lineup change as Vocalist Hollywood How and Bassist Joe Stabile parted ways with the band. Knowing this was merely a bump in the up and down road of Rock, this troop of classic Hard Rock/Heavy Metal veterans carried on by hiring Bassist John Moyer of Disturbed and former Vicious Rumors Vocalist Brian Allen. Moyer and Allen joined founding members Guitarist Fred Gorhau and Drummer Mike Sakowski to mark a fresh start for the band. Taking over the stage, Dark Sky Choir was the perfect appetizer to kick-off the night. Gifting pleasing Metal cuts like “Death Of A Nation,” “Like It or Not,” “Die Young (Maybe He Wanted To),” “Show No Mercy,” and a stark cover of Rainbow’s “Gates of Babylon,” Dark Sky Choir elated the already wild crowd. Seasoned in Rock, Gorhau’s tasty Metal riffs alongside Allen’s howling vocals and wicked stage presence drew praise for Dark Sky Choir from the packed house. In 2016, a group of men decided to play music together. The way most bands start, they decided on a name - Dark Sky Choir. An original name for an original hard rock metal band out of New Jersey / New York area. A year later in 2017 Hollywood How and Joe Stabile were replaced with Brian Allen and John Moyer. Each of them bringing their talents to Dark Sky Choir creating a band that is not only making a name for itself, but leaving their mark on the venues they perform in, and music in the ears of their fans with each live show, video, and track they share. On Saturday, Feb. 9, Dark Sky Choir will be performing at the Starland Ballroom in Sayreville New Jersey. Joining them for a night of hard metal greatness is Ascending From The Ashes, Broken Past and Channeling Cornell - The Ultimate Chris Cornell Tribute. Special Guest is Tim Ripper Owens, former Judas Priest frontman will be performing a few songs with Dark Sky Choir. It is a show not to be missed. Dark Sky Choir has decided to give the first 500 people through the doors a copy of their brand new "End Of Days" CD. For tickets and availability please check out the event details here (Tickets). Dark Sky Choir is an original hard rock/metal band from NJ. Formed in 2016, the band originally consisted of four veterans of the local music scene, playing the classic metal music they all grew up listening to. As their local popularity increased as a tribute band, it was inevitable that they soon began writing their own music. Gorhau has spent the last 7 years touring the USA and Canada as a lead guitarist for the holiday-themed progressive band The Wizards of Winter, playing alongside some of the original vocalists from Trans-Siberian Orchestra. Sakowski has been a drum teacher and career drummer for the past few decades, performing in the local scene with countless cover bands. Both have also toured the US and Europe with the metal band Exxplorer. In late 2017, original vocalist, Hollywood How, and bassist Joe Stabile were replaced with Brian Allen and John Moyer, respectively. Allen has been the voice of various bands throughout the years, most notably as the frontman for Vicious Rumors for almost a decade. Moyer is best known as the Grammy-nominated bassist for the world-renowned metal group Disturbed, with whom he has recorded and toured since 2004. When John is on tour with Disturbed, Percy Trayanov from Madame Mayhem takes over on bass duties. Inspired by a lifetime love of metal, Dark Sky Choir brings years of live and recording experience to the stage with their own brand of hard rock and metal. Earlier this year they released an EP titled Reboot, and embarked on their first national tour, opening for Fozzy. Their brand-new full-length album End of Days was just released in conjunction with their five-week national tour with Monster Magnet. Hailing from the Pacific Northwest, Brian Allen is currently the front man for the Bay Area thrash-metal band Vicious Rumors. He has long been a staple of the metal scene, singing with such bands as Last Empire (who signed with the Underground Symphony Label in 1999), and Two-Headed Beast, since 2015. He joined Dark Sky Choir in the fall of 2017 to record their self-titled EP. DARK SKY CHOIR is pleased to announce our new guitarist IRA BLACK! Ira is best known for his work with I AM MORBID, LIZZY BORDEN, DOKKEN, METAL CHURCH, WHERE ANGELS SUFFER, HEATHEN and VICIOUS RUMORS. Ira endorses Dean Guitars, Floyd Rose, EMG, Stone Tone, Mezzabarba Amps and Rockwood Clothing. Ira joins us from Los Angeles, CA and will be a huge part of the Dark Sky Choir family and music. Please help us welcome him to the Dark Sky Choir family and check him out on the upcoming Bobaflex tour! The latest addition to Dark Sky Choir is Bulgarian born bassist, Percy Trayanov, who began his musical training at the age of 6, studying to be a classical pianist! Later, he also studied the bass guitar at the Bulgarian Academy of Music, which lead to him playing with Burning Sound, one of Bulgaria’s top rock bands in the 1990s. After relocating to the United States in 1999 he was a founding member of CYLAB. He would later go on to play with such bands as RBD, Acey Slade & The Dark Party, Ace Frehley, Combichrist, and Black Light Burns. More recently he could be seen with The Dirty Pearls, and on stage with Lady Gaga, before touring extensively with Madame Mayhem from 2016 through 2018. He joined Dark Sky Choir in September of 2018 for their fall tour. Drummer Mike Sakowski has been a member of the local NY/NJ music scene for almost four decades as a performer and instructor. In 1983, Mike co-founded the metal band Exxplorer, with whom he played and toured for more than 30 years. Since the early 1990’s he has played with various groups including, Tin Pan Alley, Yesterday’s Child, and numerous cover bands. He is a founding member of Dark Sky Choir.